The purpose of knowledge management is to share ideas and experiences, and to get the right information and knowledge to the right person at the right time. Rediscovering knowledge is a form of rework and sometimes runs rampant, especially as it relates to monitoring and event management, since in many cases there are just too many monitors to make knowledge sharing very easy. This is where a unified monitoring solution can help. The modern IT stack has become diverse and distributed, and multiple monitoring tools make managing heterogeneous platforms and multi-vendor devices a huge challenge. This has the following impacts on knowledge management. When each tier uses a different monitoring tool, it’s easy to see how the “not my problem” mindset can be perpetuated in an organization. In some ways, this can lead to a culture that tends not to share knowledge. The lack of a single integrated view into end-to-end IT services inhibits rapid, proactive diagnosis and resolution of end user performance issues. This is a form of real-time knowledge sharing that directly impacts the bottom line. Knowledge tends to become as fragmented as the number of different monitoring tools in use. There’s no single pane of glass that can aggregate all knowledge artifacts, particularly as they relate to the management of events. Following the links above will offer more details on #1 and #2, but what about aggregating knowledge artifacts? This post will provide a few details on how eG Enterprise addresses this aspect of knowledge management. eG Enterprise provides a single pane of glass view that allows enterprise IT teams to collaborate easily and solve key problems. Unparalleled visibility also allows IT architects to determine how to right-size and optimize their IT infrastructures for maximum ROI. Our patented automatic root-cause diagnosis technology is designed for dynamic, inter-dependent physical, virtual and cloud infrastructures where proactive monitoring and rapid diagnosis of problems is a challenge. When an administrator views measurements in eG Enterprise, each measurement has an associated icon, that when clicked will show the fix history tab associated with that measurement as illustrated below. 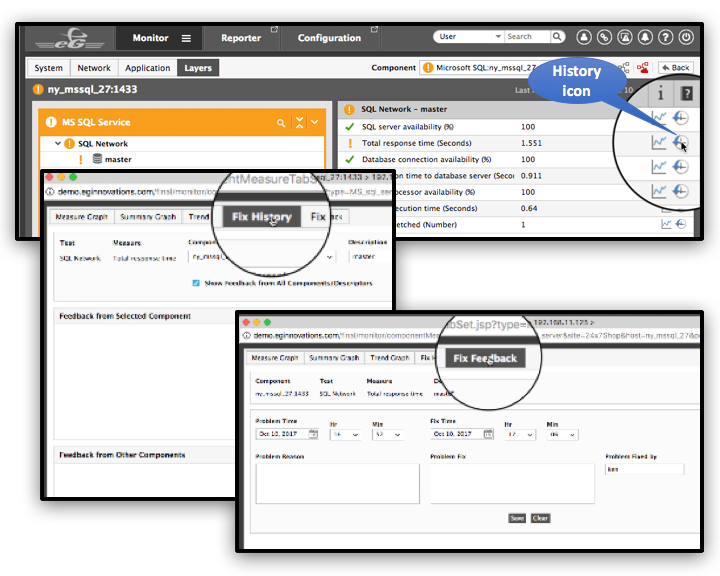 Monitor users can see the fix history as they navigate eG Enterprise without having to search for knowledge about a specific measurement. The fix history page allows viewing of the details associated with a selected component, test, measure or descriptor. The eG Enterprise knowledgebase allows authorized users to search the knowledgebase as well. These searches , or a specific component, an IT system, an IT a service, or a zone (i.e., a data center or a geographic region). Of course, searches can also be by a specific problem/fix of interest as well. The service monitoring intelligence provided by eG Enterprise is ideal for sharing knowledge across diverse IT stakeholders. This is consistent with service management, IT-as-a-Service and DevOps movements. Improve the quality of decision-making by sharing knowledge, information and data throughout the service lifecycle – for example, operational data used in Incident and Problem Management or Capacity and Availability data used in service design. 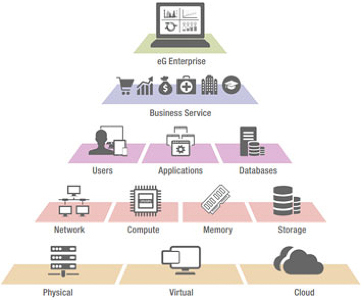 While each customer may be at a different stage of the IT transformation journey, eG Enterprise can enable this kind of cross-domain knowledge sharing regardless of how far down the road you are. In addition, its intuitive user interface makes it ideally suited to enable use by a wide range of IT stakeholders. So, unify your monitoring environment today and stop the ‘not my problem’ wars. Allow your service teams to leverage eG Enterprise, share knowledge and accelerate your IT transformation. 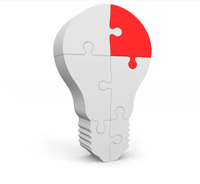 The post How Unified Monitoring Benefits Knowledge Management appeared first on eG Innovations.